Favela, Auto-Sprawl, and Social Capital. Remember that quote, attributed to Winston Churchill, that any architecture student has probably heard a gajillion times? “We shape our buildings; thereafter they shape us.” It’s a crucially phenomenologist thing to say. If there was a less likely phenomenologist than Winnie the British Bulldog, I can’t think of who it might be. As an adolescent I read the Churchill biography by Violett Bonham Carter, and I don’t recall the sensitive soul of a Juhani Pallasmaa, a Peter Zumthor, or a Kazuyo Sejima. A worthwhile presentation by Juhani Pallasmaa, “Landscapes of Architectural Education: Architecture, Knowledge and Existential Wisdom” – Click through for video. As I mentioned, Churchill’s sentiment reflects the phenomenological approach to building and dwelling (as the pioneering phenomenologist, Martin Heidegger, refers to the process of establishing and occupying habitation) in that it indicates a reciprocal relationship between the dwelling and the dweller. Churchill reveals this reciprocal or intersubjective relationship by admitting that we are not necessarily isolated masters of the world around us as was assumed in Western thought for many centuries, but as the comment suggests, the world we inhabit exerts its own influence on us. Since Churchill, we have further explored the way that the built environment influences us in subconscious and conscious ways that would be extremely difficult to quantify entirely. “Winston Churchill: An Intimate Portrait” is pretty badly written but interesting and important, I suppose. Click through for the Amazon entry. To take Churchill’s thought one step further, we really only shape our buildings in the sense that our consciousness–individual and aggregated–acts as a conduit for the world as we perceive and process it. Thus we conceive of and build new, unique (to varying degrees) versions of the buildings we experience day-to-day, moment-to-moment. So, a more thorough approach to Churchill’s statement reveals that the relationships of previous dwellers (we’ll use the Heideggarian “dwell” to comprise the act of building and inhabiting architecture) to their own built environments will manifest itself in the buildings they leave for subsequent generations of dwellers who will receive the influence and pass it along through their own designs and constructions. And so the cycle continues, each architectural work appears as a manifestation of all the influences that resulted in its formation, and it then participates in the complex of new influences upon new generations of dwellers (again, meaning designers and everyone else). The sociologist Erving Goffman discussed the built environment as “assemblages of sign-equipment.” That is to say, all of the designed and constructed objects that comprise our built environment send their cues in guiding and in some senses even strictly controlling our behavior. This relationship is very similar to Heidegger’s notion of technological enframing discussed in a previous post: the power of all designed and constructed objects (technology) to influence our behaviors, our ways of perceiving and interacting with other people and the world around us. As a new dweller of Houston, Texas, one of the world’s most auto-oriented, sprawling metroplexes, I am reminded of this enframing power, the power of sign-equipment to modulate even control my behavior every day. For example, there is literally no other practical way for me to do what people do in cities (travel to and from work, procure food, see to physical health and recreation) without the mediating sign-equipment that is my personal automobile. The nearest grocery store is a mile from my home. The mile per se wouldn’t present much of an obstacle, even with groceries on the return trip. But it is a mile of five lane boulevards, badly marked crosswalks, no bike lanes, and not one linear foot of sidewalk. I would literally be taking life-threatening risks placing my body in that sort of environment: it simply is not designed for bodies. Its design is a stranger to the scale and proportion or the human body. It is designed primarily according the proportions and operational requirements of the passenger automobile. Graphic showing relative density of major world cities. Houston is not fooling around automobile-sprawl-wise. Click through for source. As I mentioned, we are new to our neighborhood and as such, we’re making a conscious effort to get to know our neighbors. The other day, we had our next-door neighbors over for Saturday lunch. In the course of the get-to-know you chat, our friends mentioned what a rarity it was to be in a neighbor’s home. Both friends are Houston-area natives and neither had ever lived in a neighborhood that was not primarily designed to accommodate cars. Naturally, I brought up the social difference that a human body-scaled neighborhood can make. I mentioned the time I’ve spent live in highly walkable neighborhoods both in the US and in Brazil. I mentioned that even in the most economically disadvantaged favelas, there is a sense of community that comes reciprocally with the human-scale of the built environment. I say “reciprocally” because it is not a strictly linear causal relationship, with one discrete cause and one discrete effect. When human body is the primary consideration in the design and construction of the built environment, it then promotes and facilitates human needs. It is a nuanced, reciprocal relationship. Showing the divergence between living and working in Houston. Click through for source. In the course of conversation with our new neighbors, we discovered that they both commute about two hours to separate, distant parts of the metropolitan area. Nearly four hours of their respective days are spent behind the wheel and looking at brake lights. Our street, like nearly all of Houston, is exclusively designed for vehicle traffic. The one friend lamented behaving “like everyone else”: Leaving home through the garage, ending the commute with the garage door opener and entering the house through the garage door. Front doors are the nearly-exclusive domain of proselytizers and sales people. That’s the sign-equipment power of the car suburb, the power to isolate families and individuals, to literally curtail a sense of community. The reverse is shown to be true in favelas. Despite economic disadvantages, or whatever other factors may potentially detract from quality of life, one study, cited in Jornal do Comércio showed that 94% of respondents reported being personally happy, much of that feeling springing from their sense of community. Whereas, as demonstrated in the the seminal book “Bowling Alone” by Harvard’s Robert Putnam, as America suburbanizes, it’s population tends more toward isolation, civic withdrawal, and lack of personal fulfillment. The difference between most favelas and most suburbs is that the unspoken regulations that go to shape informal developments have as their nexus the requirements of the human body. The scale is of footsteps, shoulder widths, and head heights—not door swings and turning radii as in suburbs. Lately those of us studying people in relation to urban settings are increasingly using the term “social capital” to describe the value associated with community and interpersonal relationships we form as neighbors and citizens. Though the term certainly has its usefulness, it strikes me as the same sort of inane tenchobabble that we use to cram common sense notions into the market-oriented worldview. We had to come up with terms like “human resources” to empiricize people who work together, something we’ve done as a species since before we stood on hind legs. We’ve drawn strength from our relationships for just as long, but we started studying “social capital” in earnest, in particular of late, because we noticed it was yet another system out of whack. James Howard Kunstler provides a humorous and compelling if not infallible argument against auto sprawl. Click though for video. The arithmetic is never so straightforward as car equals lost social capital, but automobile suburbs have a unique power to isolate, and that isolation breeds isolationist modes of engagement. There’s a sense in the market-oriented mentality that we can only improve circumstances once we have the data to justify and track change. So, in this sense, empiricizing human civic and communal interaction as social capital is good, because so many of our communities need that change and they may never otherwise get it. The ultimate hope however, would be to measure social capital (strength of human relationships), find it lacking, then conclude that its absence is caused by planning our built environment around something other than the human body—removing that common sense principal and artificially inserting new factors. The sooner we start using the human body as a primary datum, a primary design input for planning, the sooner human bodies can interact with other human bodies in a fashion that is, dare I say, more natural. And then the power of that natural tendency can once again exert itself as a force in future decisions and engagements both civically and in design. 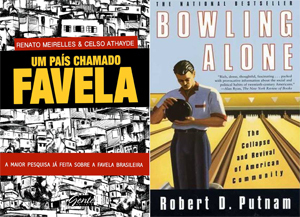 Meirelles and Athaides’ “A Country Called Favela” and Putnam’s “Bowling Alone” — Thorough studies of favela and suburban life respectively. In fact, this is one of the predominant strengths that informal neighborhoods have in relation to some of their formal counterparts: the reciprocal relationship of designing the built environment according to the human body and an elevated sense of community and belonging (very much in keeping with Heidegger’s notion of dwelling). Informal neighborhoods arise as a web of the decisions and needs—both conscious and unconscious—of people interacting with each other. That is the very basis for their form. And what they lack in other sorts of capital, they quite often make up for in social capital. The power of Goffman’s sign-equipment is subtle. It does not verbalize “stop” or “go” or “yield” let alone, “interact with your neighbor” “enjoy a meal as a group” “chat about your children or the weather or your job” but its power to influence our behavior is nonetheless very real. We may never even consciously notice it until it is brought to our attention somehow—when it is measured, perhaps. During lunch that day, my neighbors noticed that, when they stopped to think about it for the first time in their auto-centric lives, their neighborhood planning had a profound influence on their every day behavior. They also noticed that social capital, the wealth and power of human relationships, if it does nothing else, definitely improves quality of life. In their case, their built environment has had a very specific set of effects on their daily routines. Churchill would say, their buildings have shaped them. Their built environment has set them in a mode of living that reduces social interaction and physical activity, increases interpersonal isolation, and wastes a lot of time and resources. But, slowly, more people whose lives, like my neighbors, have been trained by the “assemblage of sign-equipment” are yearning for increased social capital and the other benefits of a body-centric built environment. And, as more of us “shape our buildings” according to human bodies, those buildings will reciprocally influence us—our bodies, our lives—for the better.